Winter, 1913. On a frosty and dark winter night a misty coldness descended upon New York. The cold crept along the parks and streets of the Bronx, seeping in through every crack and crevice of every respectful home scattered about. Near the Mosholu Parkway, just below the dense tree line that existed back then, something strange lurked. A creature described as ‘werewolf like’ by those unlucky enough to have stumbled across its path at night. Even more astonishing was the fact that many were also describing a soft glow emanating from the creature. Many believed this to be a rumor, however one late December night the creature stepped out of the shadows and into the sleepy streets of the Bronx.That night, the phones rang off the hooks at the Kingsbridge Police station. The reports were bizarre and the callers sounded frantic. Whatever it was that the callers were reporting, undoubtedly sent extra chills down their spines that cold night. 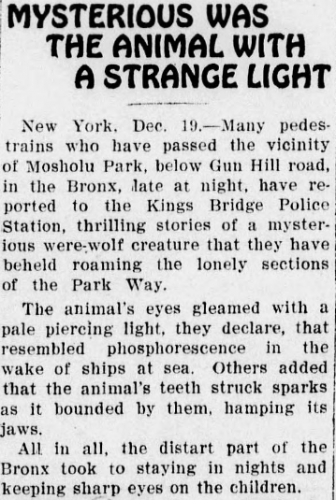 “The animal’s eyes gleamed with a pale piercing light” reported a witness, adding that the light “resembled phosphorescence in the wake of ships at sea.” Others reported sparks flying out the creature’s mouth as it snarled at them. A creature they could only described as werewolf-like. A horrible beast, a mutated canine of sorts with a pair of glowing eyes. However absurd or horrifying the reports seemed, the Bronx Precinct had a duty to venture out in the cold and investigate. That night the Kingsbridge station sent down a few of their men to investigate the source of these frantic callers. 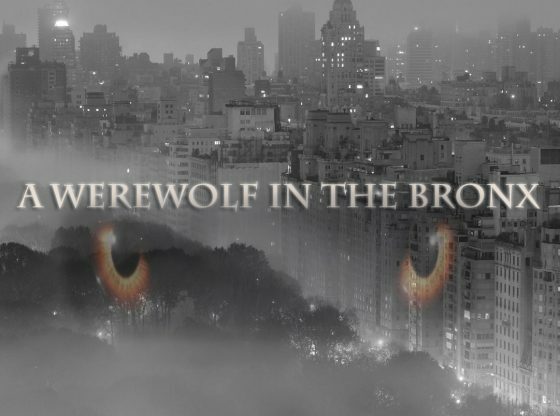 Kingsbridge’s Police Captain, Matt Mekeon issued an alert to his squad to be on the lookout for the supposed werewolf as well as a recent mugging that had occurred near the Mosholu Parkway. While patrolling the desolate parkway, Officer Mckiernan came across four suspicious men who were loitering around an unlit area of the parkway. Thinking that these might be the muggers, he approached the four men. The men suddenly took off running in different directions and a short chase ensued ending with Officer Mckiernan catching one of the suspects. As the policeman cuffed the perp, a sudden sharp pain shot up the officer’s leg. Looking down at his leg he was horrified to see what he could only describe as a ‘phosphorous-covered hound’ clamping down on his boot. 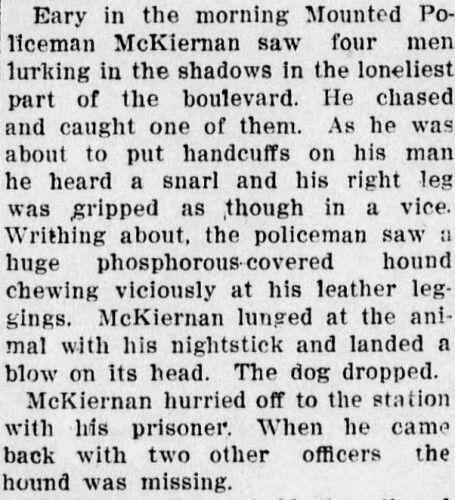 The officer acted quickly and used his nightstick to deliver a heavy blow to the creature’s skull, forcing it to release the officer’s leg from its vice-like grip. The officer and his perp were able to get away from the glowing creature and make it back to the precinct safely. After booking the man at the station, the officer told the rest of the men of what transpired out by the parkway. Soon, a squad of the men from the Kingsbridge precinct made their way to the exact spot the beast had taken a beating from the frightened officer’s nightstick. To their relief, there was no beast in sight. No glowing set of eyes, no bulking canine dosed in a phosphorous glow. The Parkway remained still, frozen in an eerie silence until the warming sun broke. A soft morning glow that pushed back the icy shadows and its eerie inhabitants for at least another day that winter in 1913. It was June 1944, a few days after D-Day and somewhere in western France, a group of soldiers were ordered to watch a hill. They were in a jeep equipped with a mounted .50 caliber rifle. As they arrived on the scene, they found three dead German soldiers, who had been torn to shreds. Body parts were everywhere. According to the witness, it almost looked as if a bomb had gone off in the area. The men got out and looked at the bodies. It was around dusk. As they inspected the area, the men heard five long howls. They then saw movement on the hill and quickly retreated back to the jeep. They then watched as five bipedal canine-like creatures walked over the hill and made their way down to the dead soldiers. They proceeded to devour them, chewing through bone as if it was nothing. Somehow, the creatures never took notice of the Americans in the jeep. That is until one of the men attempted to load his gun, which resulted in the creatures looking in their direction. They began making their way towards them. The men in the jeep proceeded to open fire on the creatures who were ripped apart under the barrage of bullets. The witness estimated that over 1000 rounds were fired at them. It was now nightfall. Thinking that the situation was under control, the men proceeded to the top of the hill where they remained talking until morning. When they went back to the area the next morning to inspect the creatures in a daylight setting, they were astonished to find there was nothing there – no creatures and no dead soldiers. The only thing they found were numerous large dog-like tracks...as if a cleanup crew had come and scrubbed the area. The men assumed that there were more of these creatures roaming in the area. They felt they were in danger and they quickly left. This story was told by a grandfather to a family just prior to his death. 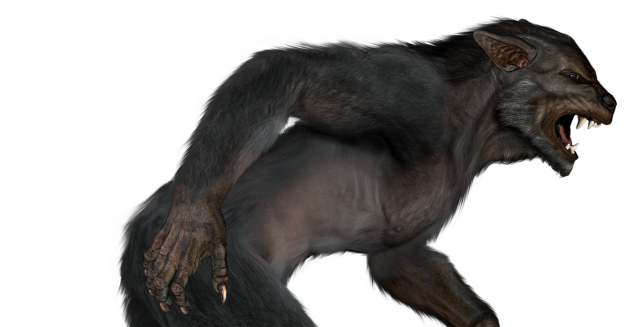 One type of monster that seems to be very pervasive in the human psyche across cultures is that of creatures with the power to transform from human to animal, and by far the most well-known of these entities is the werewolf of legend. Yet there have always been those who believe that these are not merely the product of our imagination, but very real monsters that lurk out beyond our understanding. One such creature seems to have crept out of the shadows of lore in the aftermath of a terrible tragedy in the Caribbean country of Haiti, where survivors of a terrible earthquake have had to deal with homelessness, lack of resources, looters, thieves, and apparently werewolves as well. Far from coming from any one single origin, tales of werewolves have been present in cultures throughout the world for centuries, and they have been known by many names. In ancient Greece they were known as the lycanthropus, in Ireland the faoladh or conriocht, the Dutch had their woerwulf, the Italians their lupo mannero, in France they were referred to as the loup-garou, for Serbians the vulkodlaks, and East Europe had its mardagayl in Armenia, and varkulak of Bulgaria. In South America they were known as the lobizon, in Trinidad the legarou, and on and on it goes, with this persistent myth of shape-shifting monsters prevalent across a surprisingly far-reaching range of peoples and cultures, although the means by which these individuals transform and their reasons for doing so can often differ, as can the aspect of whether they can actually control these transformations or not. They can be half wolf or half bird or any animal, but werewolf just means that they practice an evil art of Voodoo where they wear the skin of an animal and kill in the night. There have been many men who have been lynched when they were found out to be werewolves. Werewolves are normal men that use Voodoo to use the skin of an animal to turn themselves into monsters in the night. Because they are so strong when in their skin, the best way to kill a werewolf is when it is in the form of a man. Stories of je-rouges have always terrified Haitians, and the myths cut across religions and socioeconomic borders, with belief in these creatures strong especially among the poor. Far from being seen as a mere legend, many Haitians truly believe that these creatures really exist, and claim to have seen them prowling about. Indeed, this belief is so strong that strange deaths are sometimes blamed on them, and suspicious people can be accused of being a je-rouge and lynched by frightened villagers. 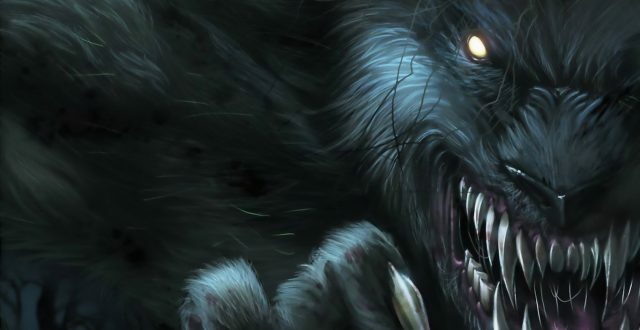 The latter part of the 1800s saw a mysterious tale of shapeshifting surface out of Germany – a country that has a long and checkered history of encounters with werewolves. It’s specifically to the year of 1879 and the town of Ludwigslust to which we have to turn our attentions; a town with origins that date back to 1724, when one Prince Ludwig – also known as Christian Ludwig II – had his workers construct a hunting lodge in the area. Such was the prince’s love of the area, he renamed it Ludwigslust. Today, the town is dominated by the huge Ludwigslust Palace. In 1879, however, the area was dominated by werewolves; a family of them. Even more than a century after the prince’s passing in 1756, the area was still a favorite one for hunting wild animals. One particular creature that became almost legendary was a large, wild wolf that seemingly was completely unaffected by bullets. The brazen beast would even creep up on hunters and steal their bounty: their dinner, in other words. It’s no surprise that word soon got around that maybe the wolf was more than just a nimble animal that had been lucky enough to avoid getting shot. Some thought it was supernatural in nature. Others, in quiet tones, suggested Ludwigslust had its very own werewolf. They were right. On one particular day, a cavalry man rode into town atop his horse, with the intention of meeting a man who history only records as Feeg. The military officer found Feeg’s isolated home quickly. But, he didn’t find Feeg. Instead, he was confronted by a terrified group of young children who were seemingly fleeing for their lives, amid hysterical cries for help. One of the group breathlessly told the soldier that none of the family were home – except, that is, for a young boy who, the man was told, had shapeshifted into a werewolf before their terrified eyes. Quite understandably, none of them wanted to hang around to be attacked by the child-beast. With the petrified group standing on the fringes of the property, the man made his tentative, cautious way towards the house. As he got to the door, the boy loomed into view; although, by now, he had reverted back to his human form. The cavalry man ordered the child to tell him what diabolical activity was afoot in the Feeg house. He soon got an answer; a deeply sinister one. The boy told the man that his old grandmother – who comes across like a wizened old witch in the story – possessed a magical strap that, when he wore it, would transform him into a wolf. Incredibly, when asked to prove his claims, the boy did exactly that. The man, however, was leaving nothing to chance. He told the boy not to tie the strap around him until he, the man, was safely in the loft and with the stepladder out of the hands of the child. Now safe from attack, the somewhat skeptical man essentially said, “Do your worst.” He did. As he placed the belt around himself, an uncanny transformation occurred and the boy, in an astonishingly quick fashion, mutated into the form of a large, formidable wolf. The beast-boy raced out of the front-door, terrorizing the group of children who, by now, had tentatively got closer to the property, and to the point where they fled for their lives. The werewolf then raced back into the house, flung off the belt, and immediately transformed back into human form. Despite the boy’s savage state when in definitive werewolf mode, while in human form he was placid and even polite – even to the point of letting the cavalry officer examine the belt, which, to him, exhibited no abnormal traits at all. The man soon made an exit and shared his strange story with a local forester, who near-immediately concluded the werewolf-boy and the elusive, bulletproof wolf that had plagued the landscape for so long were one and the very same. The hunter proved to be highly proactive: he secured a number of silver bullets, vowing to slay the beast, once and for all. As luck would have it, the monster soon put in a return appearance. At first, it was the same old story: regular bullets seemingly had no effect on the creature. Frustration abounded among the hunter’s friends. He, however, equipped with silver-bullets – the arch-foe of the werewolf – had far more luck, hitting the animal, in one of its hind legs. It fell to the ground, with a pained howl. It was, however, too powerful for the hunters and suddenly leapt up and bounded away and towards the town. Due to its injury, the werewolf was unable to outrun the hunters, who carefully followed it. It soon became clear that the terrible thing was heading for the Feeg home. As it shot through the door, the group followed. They entered the house, slowly and carefully, but the wolf-thing was nowhere to be seen. At least, not right away. With no sign of the beast in the living room or kitchen, a search of the bedrooms was made. Pay dirt was soon hit. Lying in one of the beds was an old lady; none other than the creepy crone and grandmother to the young boy-monster. To the group’s horror, the witch did not appear entirely human: a large, powerful, hair-covered tail hung over the side of the bed. The aged hag, in her state of pain from the piercing bullet, had not fully shapeshifted back into her human form. What became of the woman and her grandchild is unknown. What we do know, however, is that 19th century werewolf chronicler Karl Bartsch investigated the story deeply; a story that still circulates among the approximately 13,000 people who, today, call Ludwigslust their home.